The other day RancherMan & I celebrated a special occasion by going to the Cheesecake Factory. But they always serve so much food that we decided to split the entree so we would still be able to enjoy a piece of super-decadent chocolate cheesecake for dessert. Oh we got the cheesecake alright, but even splitting the entree there was no way we could eat it all and then enjoy cheesecake too, and that specialty cheesecake is the reason we picked THIS restaurant to celebrate in the first place. So RancherMan suggested we stop eating our entree, put the leftovers in a to-go container (thankfully I always bring my own GLASS reusable to-go container – I HATE those styrofoam monstrosities! ) and move on to dessert right then. So we bundled up the leftovers to bring home and enjoyed that cheesecake! But I’m going to make sure these leftovers are not wasted, I can remake that meatloaf into something new and delicious. Tonight I’ll make them into quesadillas! I chopped up the meatloaf and sat it aside. 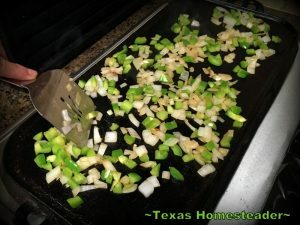 Then I pulled out the other ingredients from the fridge that needed to be used – the other 1/2 onion and 1/4 bell pepper from the Salisbury steaks I made earlier in the week, the last of the diced jalapeno left in the fridge and some shredded mexican-style cheese from the freezer. I chopped up the onion & pepper and put a little olive oil on my *2-burner cast-iron griddle (dang I <3 that thing!) and cooked them until the onions were translucent. Then I scooped them all up and mixed them with the chopped meatloaf. A little more olive oil on the griddle and I tossed a tortilla down, added a sprinkling of shredded cheese and spooned on some of the meat mixture. I finished with another sprinkling of shredded cheese. I topped the whole shebangie with another tortilla – by then everything was all melty and heated so I flipped the quesadillas and let them cook just long enough to turn lightly brown on the other side and BOOM! Supper in a flash! Remade Dish Still Makes A LOT! I served those quesadillas with a side of picante sauce, a few of those sliced jalapenos and a dollop of my homemade yogurt (a low-fat sour cream substitute for me) Supper was fast, delicious and since we were using leftovers it was dang near free! 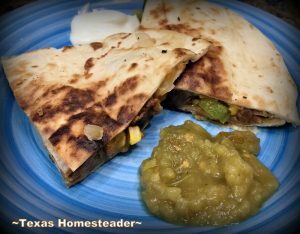 And since leftover onions/peppers/cheese were added, those two leftover slices of meatloaf were made into four very filling quesadillas so we had plenty for lunch the next day as well. YEA! What are your favorite ways to remake leftovers? 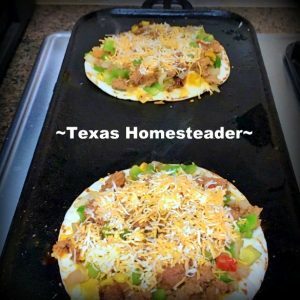 This entry was posted in Blog Posts and tagged Cooking, Environment, Frugality on April 22, 2016 by Texas Homesteader. I wouldn’t have thought about using meatloaf in a quesadilla, but that looks AMAZING. Thanks for sharing at the #WasteLessWednesday blog hop! Quesadillas are so good! I am always using leftover chicken to make them at our house. Thanks for joining the Family Joy Link Party! 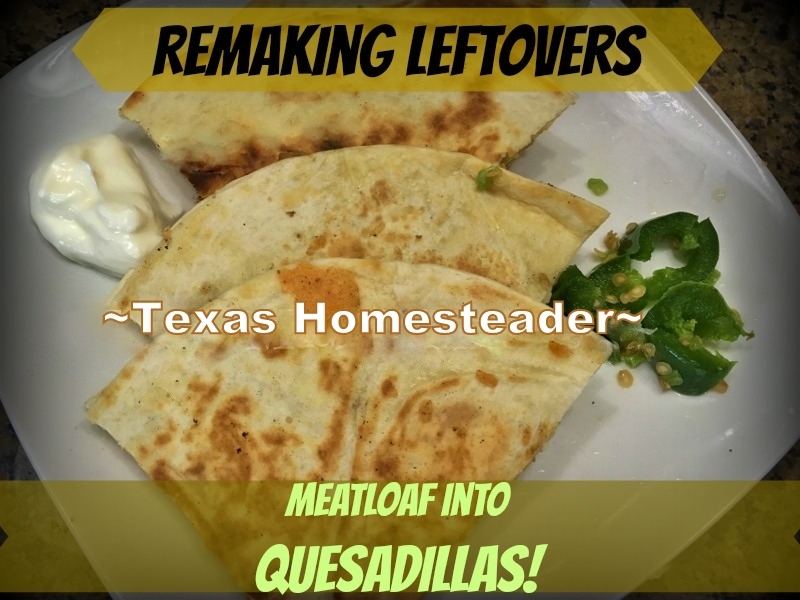 A great way to make leftovers into something new! Thanks for sharing on the What’s for Dinner link up and don’t forget to leave a comment at the party – Next week’s features that also leave a comment get pinned and tweeted! This is just the inspiration I needed for supper tonight! Thanks so much for sharing! Sometimes I just can’t seem to come up with good ideas to use my left overs. 🙂 Hope you have a great day! Oh my gosh! What a great idea to take a glass reusable to-go container. The quesadillas look yummy! Yum! You can’t go wrong with quesadillas! So smart to use your leftovers; I like to re-imagine my restaurant leftovers, too. Thanks for linking up with Merry Monday this week! I love using up leftovers! Most of the time I purposely cook enough to have leftovers for our lunches or for busy evenings. One of my favorite things to make is “leftover soup” where I throw just about anything into my soup pot along with some broth and call it supper.